I finally cracked down not long ago and decided I needed a new mirror. Since our move to Delaware I have had only the bathroom mirrors and a small make-up vanity mirror from IKEA to use. I loathe getting dressed up without a full length mirror to compare my outfit to the image I had in my mind. Most of my furniture is a dark Mahogany or warm Maple colored so I had a nice selection of mirrors. I bought this for only $586. The wonderful delivery men carried the heavy thing into the house for me for no extra charge. Then I had the fun of putting it together, my fiancé helped (did most of the heavy work... ❤). Thus with the new addition to my room I can include outfit pictures. I have always wanted a mirror like this. I really like the wood colour and the swirl design. 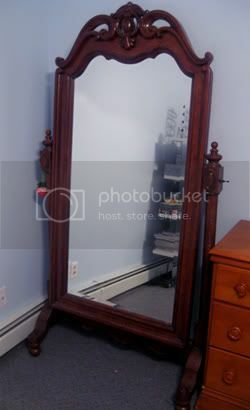 i'd absolutely love to have a mirror like this, too ♥ Sadly it could never fit in my tiny room. Lucky you! Applesushi: Thank you! I thought it was really lovely too. I fell in love with it the first time I saw it. insertcake: You could always search for thinner mirrors. Before I found this one I saw plenty of free standing and leaning thin mirrors. Madreperola: I thought so too. Thank you! It's so quaint, I love it! Thank you! But I wouldn't call it quaint though. It's huge and rather heavy.